JustBreathe Can You Drink Coffee Before Bed? Can You Drink Coffee Before Bed? You have to have your coffee fix every day. It jump starts your morning and gives you that burst of energy to get you going. It keeps your tank running throughout the day, helping you to push through those long hours when you start to droop. The question is should you be indulging in coffee before bed? You love lattes, Espresso, and anything with a deep, rich roast. As soon as you come home from work, you’re ready for another cup. You even enjoy having a cup as an evening treat before you go to sleep. It’s like dessert for you. Drinking Coffee Before Bed: Yes or No? There have been many studies about the effects of caffeine, specifically from drinking coffee, on the body. One in particular took a close look at coffee before bed. 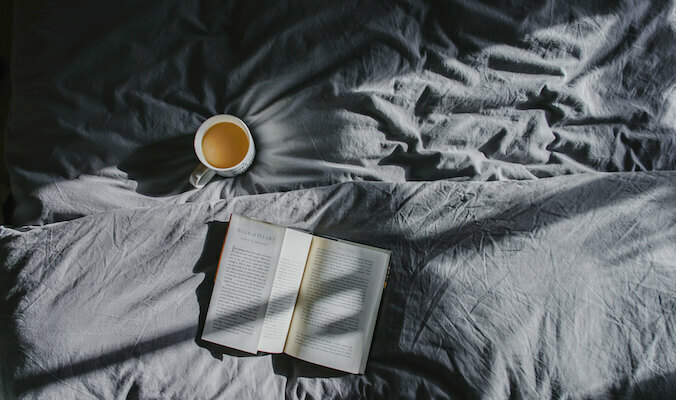 Researchers found that those who drank coffee up to six hours before they went to sleep experienced disruptions in their sleep patterns. Participants in the study were restless in the night and didn’t fall into the deep sleep that is so restorative for the body, allowing cells to recharge and repair themselves. It was common to spend more time awake for those who drank a cup of coffee six hours before going to bed as compared to those who did not indulge in caffeine. When you drink coffee regularly, you are affecting your natural rhythms, especially if you have coffee late in the afternoon and before bedtime. Caffeine is a stimulant. And, Espresso always has much more caffeine than lattes. When you have a cup of coffee, the caffeine heads to your cells and it actually affects the circadian rhythms in your body. These are the rhythms that regulate your energy levels throughout the day. When they are on track, your body is ready to be up and running in the daytime hours and ready for sleep at night. You are telling your cells to stay awake, rather than allowing them to send the signal to your body that it is time to go to sleep. Is Drinking Coffee a Bad Thing? Coffee is actually considered to be good for your health. Coffee contains a high level of antioxidants, which help your body to fight off free radicals that cause damage to your cells. It’s high in healthy nutrients and can actually give your cardiovascular system a boost. Research has suggested that drinking coffee regularly may reduce your risk of developing Alzheimer’s disease and diabetes. As a rule of thumb, if you have up to four cups of coffee that are eight ounces, you are consuming an amount that is within healthy limits that could benefit your over all well-being. The key is to pay attention to your timing. What are the Best Habits to Follow When it Comes to Drinking Coffee? To help you stay on track when you drink coffee, begin by using a smaller cup. Eight ounces of coffee at a time is plenty. You don’t want to go overboard in how much coffee you are consuming throughout the day. Remember that recommended amount of four cups daily. Think about how you want to spread that out to get the most out of your coffee. If you are like some people and you keep refilling that cup one after another in the morning, choose a Nespresso Machine, which is efficiency and convenient. But you are going to hit your quota early in the day. Pace yourself. The best time to have that last cup is 2 o’clock in the afternoon. Consider having a couple of cups in the morning when you need it most. One at lunch and then an afternoon coffee break can round out your day. You’ll find yourself drinking more coffee to stay awake, only to have a poor night’s sleep again. You have to remember that caffeine takes time to work its way out of your system. If you go past 2pm, you are more likely to experience trouble sleeping. This can lead to an unhealthy cycle of disrupted sleep patterns that make you drag in the morning. Drink your coffee wisely. You’ll still be able to enjoy all your favorites and get the quality sleep that your body needs in order to feel your best. Kathy says:,thanks so much for the post.Really thank you! Keep writing. Everybody need quality sleep, follow this instruction.